For my new year’s goal to get my blogging back up to speed again. I thought I was coming down to crunch time on the exhibit project, but due to circumstances which are due to someone else’s deadlines, it looks like the exhibit is not going to open until March (it was originally scheduled to open in mid-February, then the end of February). I’m ambivalent about this. I’m about to the point where I want to get it finished, but then again, two to four more weeks of a chance to improve on what I’ve already got done is nothing to sneeze at, either. The photo curation project has acquired several volunteers. My good friend L donated a few hours of her time, and one of the members of the collections committee (except for me, this is an all-volunteer organization) has been giving me about six hours a week of his time, too. Then there’s the college student whose school requires her to do a certain amount of volunteer work between semesters. So I have her for about fifteen hours a week for the next couple of weeks. All of a sudden the work is going much faster than it had been. Having someone to a) label photos and their sleeves before I catalog them on the computer, and b) scan the photos after I’ve done the cataloging, has really sped up the process. Quite amazing. I’ve never been on the “working with volunteers” end of the spectrum as opposed to “being one of the volunteers” before. Anyone have any good advice on the subject? It has occurred to me that some people might not know what a geyser gazer is (see my profile, at left). If you’ve ever been to Yellowstone, to the Upper Geyser Basin in particular, you may see some folks walking around, or sitting around in strategic places, with walkie talkies and the occasional notepad. You might even hear one of the walkie talkies go off, with a staticky, “Daisy, 1114, ie,” or “Riverside, 1420.” IE, by the way, means “in eruption,” meaning that the gazer who saw it did not see the beginning of the eruption. Geyser gazers are the people who make geyser eruption time prediction possible. They are volunteers, most of whom belong to GOSA, the Geyser Observation and Study Association. Many of them also subscribe to a mailing list, which is associated with GOSA but not part of it. Some are professionals, but most are enthusiastic amateurs. All of them are passionately interested in geysers, and spend as much time as possible in Yellowstone observing, communicating, and recording geyser activity, in conjunction with the park rangers and the visitor center staff. Since most geyser prediction is predicated on average intervals, lengths of eruptions, and other, more complicated algorithms, knowing when and for how long a geyser erupted is crucial to being able to predict what it will do next. Making a good educated guess (geysers are not faucets) as to what a geyser will do next makes it possible for more people to see it. I don’t lay claim to being anything more than a very beginning apprentice gazer, and I can’t spend nearly as much time in Yellowstone learning more as I’d like. But I do have a walkie-talkie (gifted to me by a very good friend), and I have had the excitement of being the first to call in an eruption. It’s all terribly addictive [g]. So the next time you see someone walking around the Upper Geyser Basin with a walkie talkie and a notepad, be glad, because that next eruption of Grand? Just may have been predicted with their help! This appears to be my week (technically — from Friday through the following Wednesday, at any rate) for finishing projects. Today I finished The Hat Project. Completely. Utterly. Right down to the printed browsing records (which is what the curator prefers to have when she’s preparing exhibits, rather than browsing on the computer in PastPerfect). All neatly in order. The hats themselves have long since been organized and curated and recorded and re-stored within an inch of their lives. And now it’s time to move on to the next project. If you need a freelance museum curator/exhibits person/writer, and you’re either in the greater Tacoma, Washington, area, or need something I can do for you via a distance connection, I’m your woman. So do please feel free to contact me, here or at my website. Everything in both wall cases is new. So is the “birthplace” sign above them. Just below the header is a timeline. Below that is a picture of the original cabin, and one of the site pre-cabin. 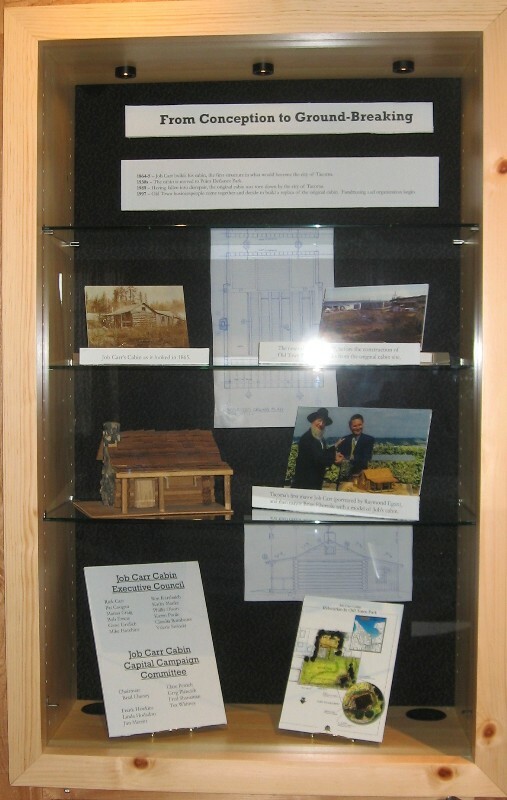 Below that is a model of the cabin, and a photo of Job Carr, Tacoma’s first mayor (portrayed by actor Ray Egan), and Brian Ebersole, the mayor of Tacoma at the time the replica was built. Below that is a list of the movers and shakers who caused the replica to be built, and an architect’s rendering of the location for the new cabin. Behind everything are cutouts from the blueprints and elevations of the cabin. More timeline below the heading. Then a photo of the construction, and statistics on the number of logs used to build the replica. Below that, some text telling about who was involved in the construction, and another construction photo. At the bottom, a panoramic photo of the dedication. More blueprint clips on the back wall. I swear I spent more time hunting down enough “stuff” to tell the story of the reconstruction of the cabin — board members, a local photographer, the architect, searching through the museum itself — than I did actually putting the thing together. And it took me about a week for the actual putting together. Right now, the fact that the exhibit is done trumps anything I may feel about how it looks, the story it tells, etc. It’s finished. And, for the moment, so am I [g]. BTW, if you’re in the Tacoma, Washington vicinity this coming Sunday, July 18th, please do come by the cabin and take a history walk and join in some living history activities. You might even get to watch me quilt in public. As a friend I knew back in Appalachia used to say. I’ve spent most of the last couple of weeks working on the 10th anniversary exhibit for the Job Carr Cabin Museum, and I’m almost there. 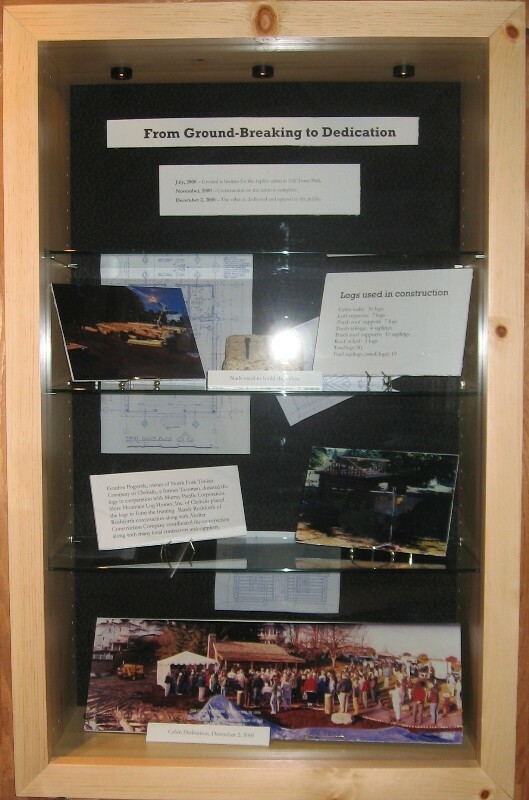 I actually spent most of the time hunting down stuff to actually put in the exhibit, which will cover from 1997, when two local businesswomen came up with the idea to build the replica of the cabin, to December 2, 2000, the day the cabin was dedicated. I have two whole artifacts — a miniature of the cabin, and some of the nails left over from the construction (they’re not standard-brand nails, but the kind that look hand-made at your local blacksmith shop). The architect who designed the replica gave me some blueprints I’m going to attach to the fabric on the back of the display. Everything else is photographs. Some came from a local business, some from one of the two businesswomen who were the driving force behind the reconstruction, and some from the museum itself. The one thing that amazed me (and not in a good way) was how there were no pictures of the groundbreaking. Or of the park pre-cabin (a very nice woman at the parks department searched for me, but even they didn’t have anything). But I did eventually come up with enough items to make the exhibit actually look like something. The board in the middle will acquire letters that say “The Birthplace of Tacoma” and be hung centered above the cases. The inside of the case with fabric, which is not solid black, but a Civil War reproduction fabric. It shows up much better in real life. The lefthand case with photos but no headers, text, or captions. That will all come on Friday (I’ve got it all printed out — it just needs to be mounted on foam core). The top two photos are of the original cabin and of the land before it became a park. The two gentlemen in the photo next to the model cabin are Job Carr, Tacoma’s first mayor (portrayed by actor Ray Egan), and Tacoma’s mayor at the time of the replica’s construction, Brian Ebersole. The diagrams at the bottom are artist’s renderings of the cabin and its landscape. The righthand case. The light-colored square thing with the three dark lines is my nail mount. The photo at the bottom is a panorama of the dedication. The other two photos were taken during construction. I will post more close-ups when the display is finished. So I’m making progress! It’s certainly been a learning experience so far. 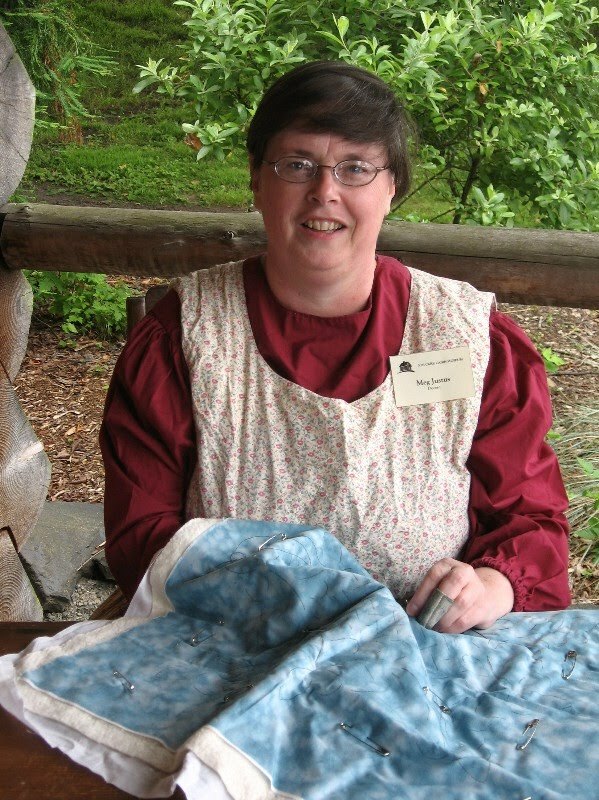 Oh, and if you happen to be near Tacoma, Washington, on Sunday, July 18th, please come to the cabin for our Living History Day. 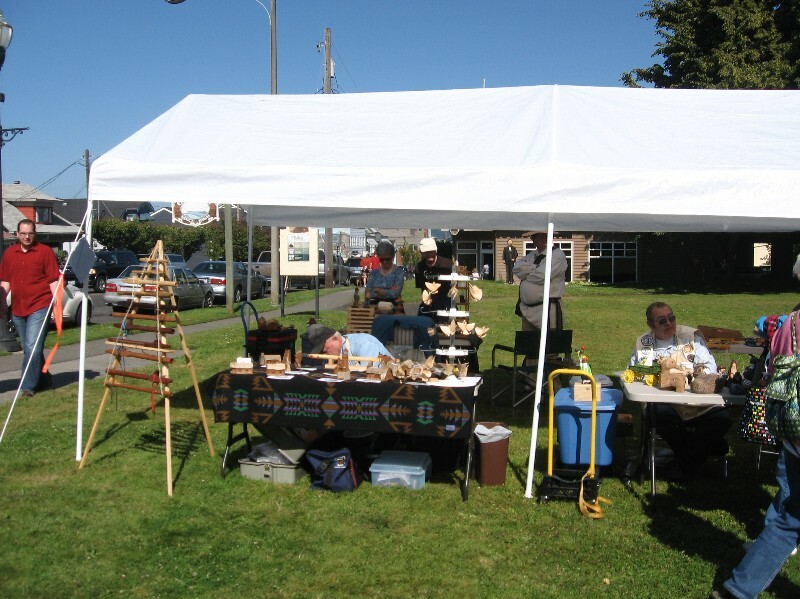 There will be walking tours of Old Town Tacoma and lots of demonstrations (including me, quilting in public again this year [g], as well as a blacksmith and a weaver and someone making butter, among others). And you’ll get to see my very first exhibit’s debut! The flower in question is a nemesia, in case you were wondering. A happy accident, picked up by serendipity as seedlings when I was doing my annual annual shopping in May. But that’s exactly what today looks like. Bright, sunny, warm, and glorious. And overwhelmingly optimistic. The weather forecaster said this morning that we here in western Washington have had exactly one non-overcast day in 55 days. That’s since early May, folks. In other news, I am now on Twitter at @mmjustus, although I haven’t really dipped my toes in so far, and I am on Linked In as M.M. Justus, with a complete professional profile. Please feel free to check either one out, and to add me as a contact or friend me. The exhibit project is coming along nicely. I met with the lady who was half of the driving force which got the cabin built ten years ago, and I have an appointment tomorrow with the architect who designed and oversaw the actual construction. I am in the process of painting the overarching wooden sign, and picking out the photos. Next up, writing the captions and shopping for mounts and background fabric. Making progress. I learned a good lesson on asking for advice last week. Be careful what you ask for. And be specific [g]. One of the challenges of this exhibit is that other than a small model of the cabin and a few of the nails left over from the construction, I have no artifacts to work with. Just photos. Which I happened to mention around and about. Which comments were mistaken as asking for more subject matter, not more artifacts. I wound up, as the museum director described it, defending the story I want to tell from all sorts of additions people wanted to make. I have plenty of subject matter to fill two small cases. What I lack is objects to tell the story of this subject matter. I’ll manage, and I’ll make it interesting. But I will never speak in such generalities on such subjects again! What’s your best advice for dealing with conflicting input like this? I would love to hear about it. Doesn’t look a day over 150, does it? The Job Carr Cabin Museum is ten years old this year. The original cabin was built in 1865. After being moved several times and allowed to deteriorate, it finally bit the dust a number of years ago. 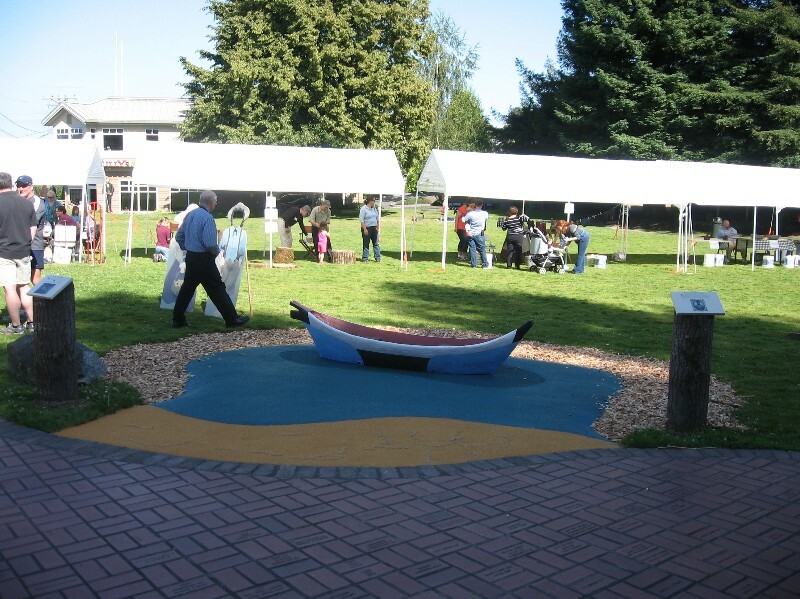 In the late 1990s, a group of civic leaders got together and decided that it was a shame that the first building in the city of Tacoma, Washington, had vanished (or, more likely, given our climate, rotted away). So they decided to build a replica. Fortunately, because Tacoma’s first settler had a son who was a photographer, they were able to replicate the old cabin accurately. It was built in 2000. Unlike the original, which was built by hand, by one man, the builders of the copy had access to modern building tools. And a crane. I suspect Job would have given his eyeteeth for that crane. 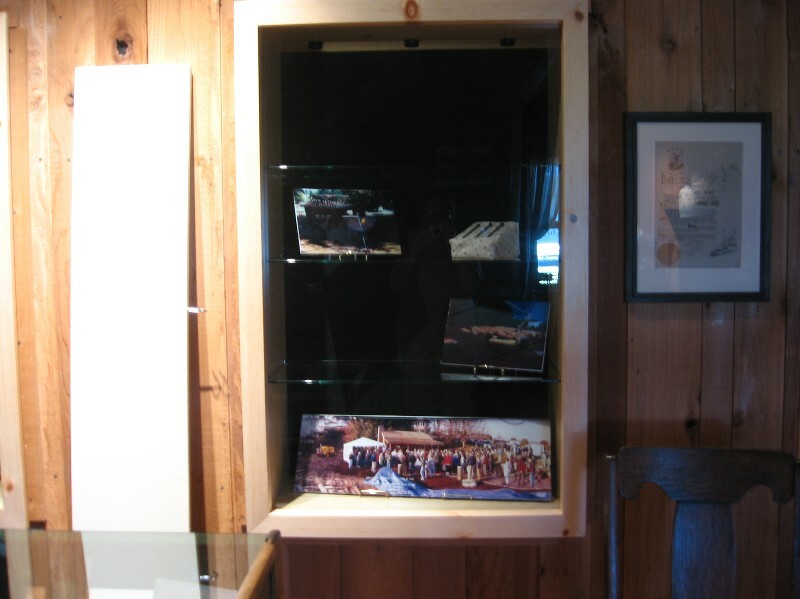 I will be putting a display together in the cabin’s two exhibit cases, telling the story of the reconstruction of Job’s cabin. I hope you’ll be interested to follow along as I construct this exhibit!